Larry Fitzgerald met Kevin Garnett for the first time as a 10-year-old in a Minneapolis hospital room. The two crossed paths while Garnett visited with young children and Fitzgerald received a routine health check-up. Fitzgerald was never the same after that encounter he told Garnett 23 years later Monday night on TNT. Garnett went on to become one of the NBA’s all-time greatest players and a future Hall of Famer. Fitzgerald followed his hero’s example on a football field instead of a court. The Minneapolis native and former Holy Angels star matured into the No. 3 overall pick in the 2004 NFL draft and a 10-time Pro Bowl wide receiver. This past season, he was named the Walter Payton NFL Man of the Year for his excellence on the field and service off the field in the community. Fitzgerald and Garnett built a relationship thanks to Larry Fitzgerald Sr.’s network as a sports journalist in the Twin Cities. Garnett said Fitzgerald Sr. was one of the first “influencers” the NBA star met when he arrived in Minneapolis and they maintained communication throughout the years. “Real recognizes real, no matter the age,” Garnett told Fitzgerald Monday. “I could see early on how you, along with [Alan Anderson] and when I first [Khalid] El-Amin, all the Minnesota kids from being young, that special look, man. You know it when those kids have dreams of their own. Fitzgerald and Garnett spoke about much more including growing up Minneapolis, learning from other great athletes, their hour-long conversation outside of Target Center when Fitzgerald was a teenager, and Fitzgerald’s successful NFL career and passion for traveling. 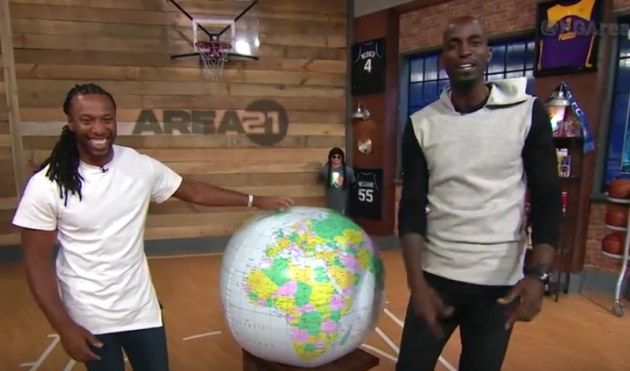 Garnett concluded the interview with a shout-out to Minnesota.